Are the glory days of the archaeologist over? Has everything cool and ancient already been discovered? Nope. Thanks to ever-improving technology, several new findings have electrified the Web. A robot explorer recently discovered ancient markings at the Great Pyramid of Giza in Egypt. The robotic device found the markings inside a secret chamber inaccessible to humans--and then proceeded to film the painted hieroglyphics and stone markings, which hadn't been seen by human eyes in 4,500 years, via a small robotic camera that was fit through a tiny hole in a stone wall. It is too soon to tell what the markings mean, but experts are hoping they may shed some light on why the ancient Egyptians originally built the tunnels. An article from CNN explains that the tunnel is "one of several mysterious passages leading from the larger king's and queen's chambers." This wasn't the first time a robot explored the passageways--but it was the first time a robot could focus on details on the walls. This breakthrough occurred thanks to a new kind of micro-camera that can be bent side-to-side instead of just focusing straight ahead. News of the discovery quickly took the Web by storm. Over the past 24 hours, Web searches for "great pyramid of giza" and "egypt pyramids" both spiked into breakout status. Also seeing big bumps in lookups: "hieroglyphic dictionary" and "hieroglyphic meanings." 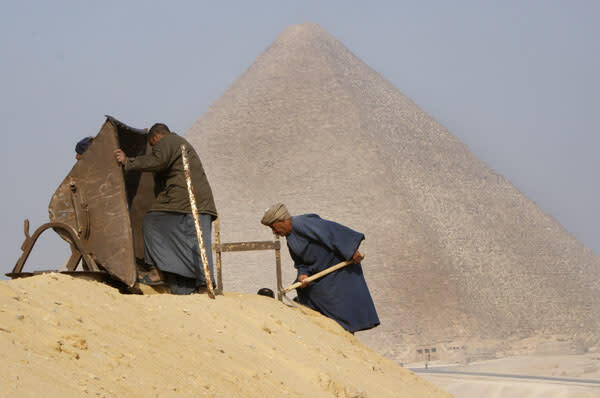 Meanwhile, other technologically enhanced discovery expeditions have turn up other fascinating new information about the pyramids in recent days. Archaeologists from the United States (with some help from the BBC) used satellite imagery to discover 17 pyramids beneath the sand and silt in Egypt. An article from Canada's CBC explains that 1,000 tombs and around 3,000 other buildings were also discovered thanks to the technology. How does the satellite-mapping work? According to the CBC, "kiln-fired bricks used to build ancient cities can be distinguished from the earth covering it" on the infrared satellite images. This find may be just the tip of the iceberg, so to speak. There may be many more buildings, tombs and pyramids buried further beneath the Earth's surface. Their tools have changed, but archaeologists shouldn't fear for their jobs. Clearly, the Earth still holds many secrets--if you look hard enough.